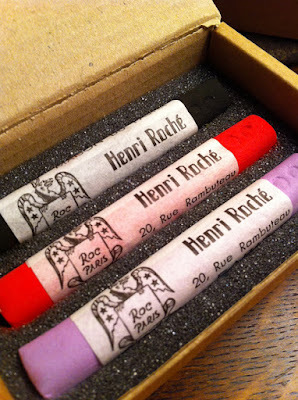 I still owe you a report on my new Roche pastels. While you patiently wait for this, I found this article in the March issue of The Scribbler that I find very helpful in describing the behavior of these top drawer sticks. Also, Charlotte Herczfeld writes some revealing analysis of Edgar Degas' style with these premium pastel sticks. Page 12 begins the article. I just skimmed the article Casey. I'l read it thoroughly at lunch--Edgar Degas was a draughtsman, cross hatching and fixatives would fit with his work. For fine line detail, I'm anxious to read (somewhere in the Scribbler) if a sanding block is used. Watercolour isn't for me for sketching. I'm enjoying my return to charcoal; I know I would enjoy using pastels--I did before, but student grade--I still use them atop watercolors. They've got substance that wC doesn't. Interesting magazine. Here am I thinking sanding block with expensive pastels--I forgot my pastel pencils. I saw them on the shelf this afternoon. I'd use the sanding block if the color and stick were the right one. I love, love, love drawing with pastels. I get right to the March issue via my link in the post, Cindy. Maybe there is a wall up for you? Anyway, I don't recall joining a website, there. Yes, our work can get expensive! I received a comment that I decline to publish. I appreciate the trading of information here, but want to be careful to be fair and accurate, too.